It is estimated that on average two people die in Ireland every year as a result of unintentional Carbon Monoxide poisoning related to domestic heating or other fossil fuel installations in the home. Many other suffer serious injury. 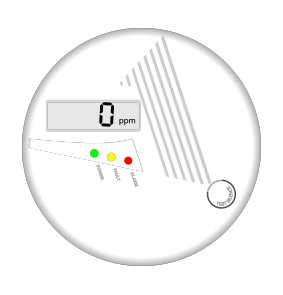 As Carbon Monoxide is a colourless and odourless poisonous gas it can be difficult to detect and all homes really should have a detection device in place. The Smartsense is an Irish made domestic carbon monoxide alarm which is designed to be installed on walls or ceilings in your home. In the event of a Carbon Monoxide presence it will provide you with an loud and effective warning. - With an alarm sound measuring 85 decibels it is loud enough to wake you up when you are sleeping. - This is an easy to install battery operated product. No mains connection is required. Batteries are include in the pack. - Audible warning to indicate end of battery life. 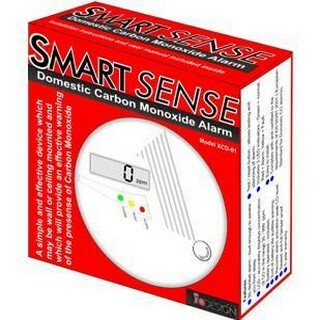 - The Smartsense Carbon Monoxide Alarm comes with a 5 year warranty. Great question that! The best answer I could give you is at least one dector should be installed and in the room that you have the gas central heating system. After that prioritise installing dectors close to the bedrooms. In summary at least one but the more you install the more secure your home will be against this threat. We have a slot in fuel burner in one former open fireplace in the dining area and an open fire in the sitting room. The rooms are separated by the foyer. We burn a combination of timber, turf and briquettes (e.g. CosyGlo) in each. Do we need one in each room? We have a slot in, glass fronted burner in one former open fireplace, and another open fireplace in another room. They are separated by the foyer and stairway. We burn a combination of timber, turf and briquettes (e.g. Cozy Glo). Do we need a detector in each room? Should the device be placed in the foyer? Or in the room with the fire source? Thanks. If getting one best to install in the foyer or in the room where the fire is used most. Probably best best to install in each room though.